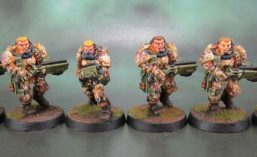 Bolt Action! 28mm T-34/85 Tank Platoon | Azazel's Bitz Box. The Imperfect Modeller’s post featuring his US Willy Jeep got me thinking about my own limited assembly of WW2 plastic kits. I then found that this post was still Photophucked, so I repaired it, noticed it was nearing 4 years old, and decided to shine the spotlight on it again, however briefly. Since this is a reblog, there are a LOT more photos if you click the link below for the full post. The T-34/85 platoon shows off their freehand slogans. 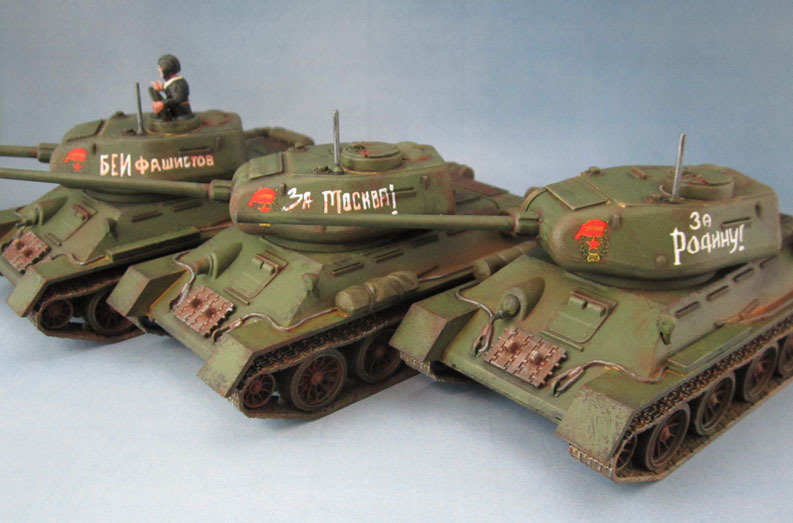 Well, I finished my first official Bolt Action models – a platoon of three Soviet T-34/85s. It took a little longer than I’d originally planned/hoped, since I wanted to get the markings more-or-less right, while still making the models look good. I found some information that the red star was used sparingly, (and that a white star was even used at times) and that individual unit markings were often left up to the company commanders, so after a fair bit of looking around, I decided that the red star added an attractive bit of spot colour to the models, as did the Guards Tank badge. I also added some freehand slogans, which was a lot of fun. ← March 2018 YDT Painting Goal Reflections. Oooh I like those tank. Tanks have really nice weathering. Very good indeed! Thank you. The weathering was really fun to apply. A lot of the older guys at the club (old being relative) play bolt action and the setups always look fantastic. I can’t say I’ve ever tried it. Have you or were the tanks bought more for the hobby side of things (they look good too!). I’ve got a ton of Bolt Action models, though I haven’t yet gotten enough painted to actually play the game yet, sadly. (just these three tanks, embarrassingly.) I’m hoping to have a couple of small forces ready to go by the end of the year, but I don’t know how likely that will end up being.